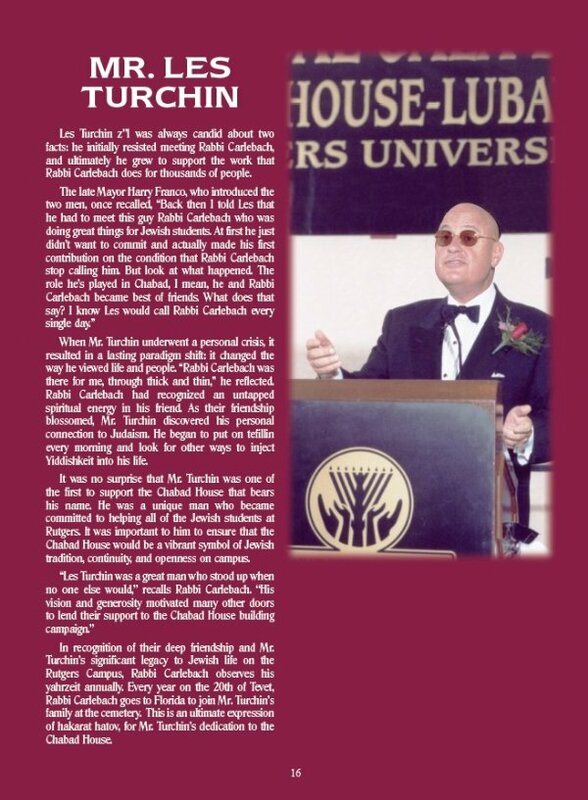 Les Turchin z”l was always candid about two facts: he initially resisted meeting Rabbi Carlebach,and ultimately he grew to support the work that Rabbi Carlebach does for thousands of people. When Mr. Turchin underwent a personal crisis, it resulted in a lasting paradigm shift: it changed theway he viewed life and people. “Rabbi Carlebach was there for me, through thick and thin,” he reflected. Rabbi Carlebach had recognized an untapped spiritual energy in his friend. As their friendship blossomed, Mr. Turchin discovered his personal connection to Judaism. He began to put on tefillin every morning and look for other ways to inject Yiddishkeit into his life. It was no surprise that Mr. Turchin was one of the first to support the Chabad House that bears his name. He was a unique man who became committed to helping all of the Jewish students at Rutgers. It was important to him to ensure that the Chabad House would be a vibrant symbol of Jewish tradition, continuity, and openness on campus. 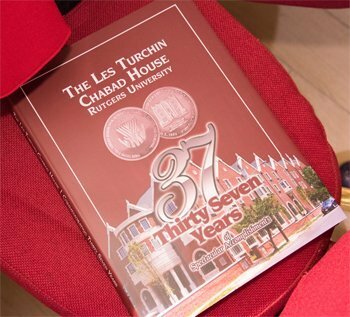 In recognition of their deep friendship and Mr. Turchin’s significant legacy to Jewish life on the Rutgers Campus, Rabbi Carlebach observes his yahrzeit annually. Every year on the 20th of Tevet, Rabbi Carlebach goes to Florida to join Mr. Turchin’s family at the cemetery. This is an ultimate expression of hakarat hatov, for Mr. Turchin’s dedication to the Chabad House.